I knew pretty much nothing about the history and culture of Iceland before my week-long trip. So, when I landed in the country, taking a history and culture walking tour through Reykjavik was pretty high up on my list. 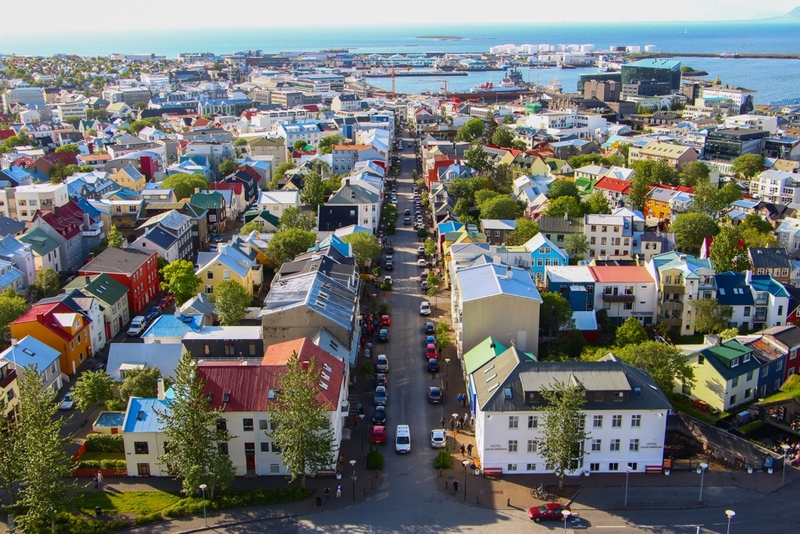 Why a walking tour through Reykjavik? I’m a big fan of the free walking tour culture in Europe. More countries need to adopt this! The first thing I look up when I land in a new city are the free walking tours. They are almost always run by locals (some aren’t – so pick one that is), which means you get more than just facts. You get personal anecdotes and a flavor of the city from someone who lives it every single day! I generally opt for one that gives you a good overall introduction on the first day, so that I’ve got my bearings right for the rest of my stay. And then, depending on the city, I’ll almost always do at least one more walking tour around a specific theme. I did a graffiti tour in Prague, a Third Reich walking tour in Munich, and a walking food tour in Rome. We signed up for a free walking tour through Reykjavik with CityWalk, and this might be – hands down – one of the best walking tours I’ve taken in Europe (and I’ve done 17!). I absolutely loved it! Sara, our guide, had a Master’s in History, and was a teacher in Reykjavik. She conducted these tours in her free time because she loved sharing the history and culture of her country with travelers! Ready to take on Reykjavik! What is this gorgeous city?! We walked around Reykjavik on a beautiful summer afternoon, covering so much information. I highly recommend taking this walking tour through Reykjavik. I absolutely love learning about a country’s history, culture and daily life. And I genuinely knew almost nothing about Iceland, so this was doubly useful 🙂 We covered interesting anecdotes about how safe a country Iceland is, Icelanders’ sense of national pride, their politics, their education system, marriage and religion, and fun facts about their daily life and culture. An afternoon well spent with this walking tour through Reykjavik! While Swedish, Danish and Norwegian languages have been adapted over the years, Icelandic remains the closest to the original Viking language! Iceland is one of the safest and most peaceful countries in the world. They don’t have an army! 90% of the houses are heated by geothermal energy. In fact, the underlying heat from geothermal sources automatically clears out the streets when it snows. SO cool! The Icelandic government provides higher education for all (Master’s, PhDs, what have you)! This is the reason 70% of the population has a graduate degree – that is seriously awesome. Education is a cause that’s really close to my heart; a country that prioritizes it deserves a ton of credit. For nine years in a row, Iceland has ranked first for gender equality, according to the World Economic Forum. It is the first country in the world that requires companies to legally prove that they pay men and women equally. They also grant equal maternity and paternity leave. I LOVE THIS. Should I move to Iceland?!? I don’t want to ruin all of it for you, so I’ll leave it at that 🙂 If you’re in the city for a day, you must make time for this walking tour through Reykjavik. I’d also highly recommend exploring the city’s rising coffee culture and hip café scene. Note: I was in no way compensated for this review. I just really enjoyed this experience, and wanted to share it! A great bakery we spotted on our walk!